Verifying income just got radically easier. With Finicity’s VoI report, income insights are in your hands in seconds. No more tax transcripts or manual verifications. This report will speed up your origination process, while improving the experience for all involved. Check out a sample report and see the key elements provided. Simply hover over highlighted sections for more information. Also check out a sample of our Verification of Assets report here. This is the ID that is used to request copies of this report and is the Re-Issue ID. 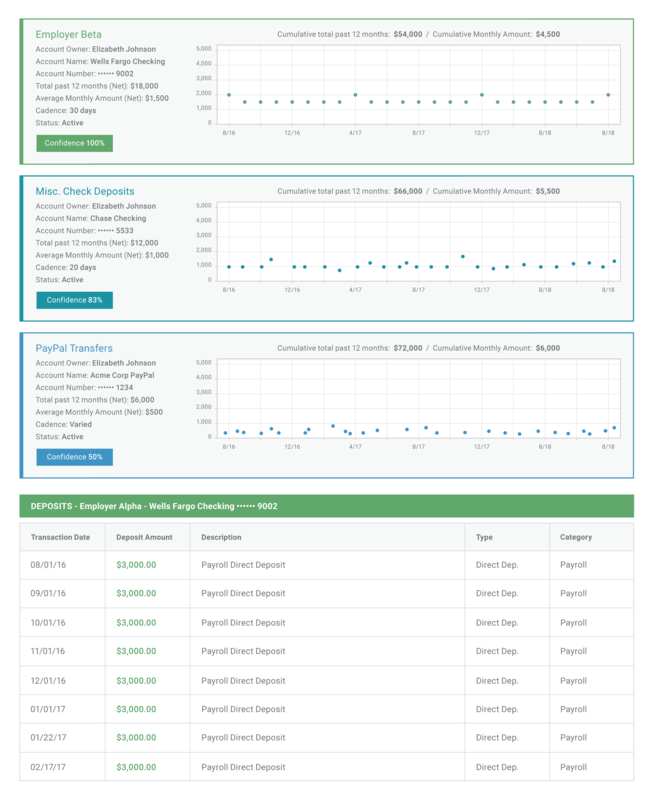 Utilizing deposit transactions filtered through an intelligent machine learning-based process, we provide estimates and projections of income. Two income estimates are provided – a high and a moderate estimate. The high confidence estimate is based on the income streams meeting a set of stringent standards determining a deposit is recurring income, thus receiving a high confidence score. The moderate income estimate is based on the same criteria, but not achieving as high a score. The sum of all deposit streams during the last 12 months, that are categorized as ‘Income’ with a high confidence. An estimate of gross annual income is based on the net amount using the most conservative assumptions about tax rates, filing status, and typical deductions. This amount is only an estimate. Other lower confidence deposit streams wouldn’t be used, but can be found in the moderate confidence summary. Using only active deposit streams that are categorized as ‘Income’, an annualized income amount is calculated. 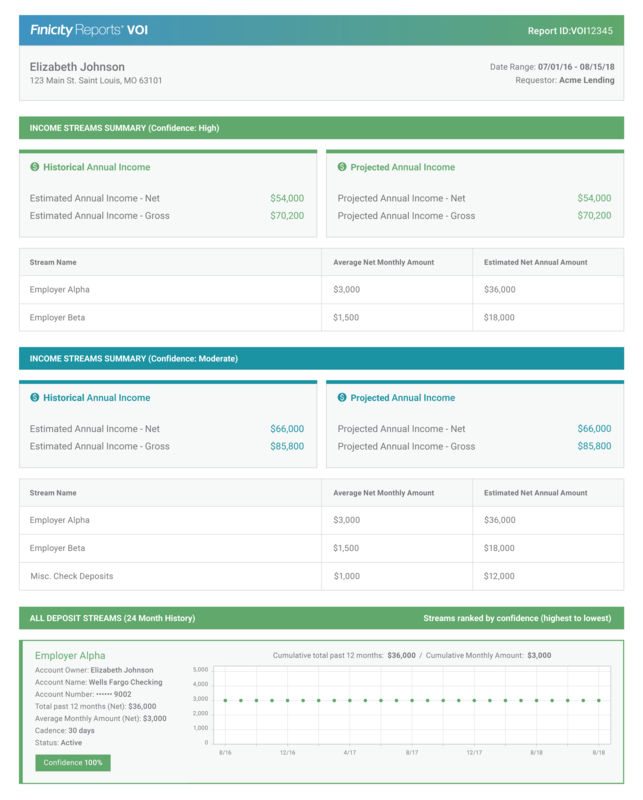 An estimate of projected gross annual income is based on the projected net annual income using the most conservative assumptions about tax rates, filing status, and typical deductions. This amount is only an estimate. Other lower confidence deposit streams wouldn’t be used, but can be found in the moderate confidence summary. Each stream used to calculate the historical and projected income in this confidence level is listed here with monthly and annual amounts. A deposit stream is a grouping of transactions with similar payee description, cadence, and amount. A grouping must have at least 3 transactions in order to qualify as a deposit stream. Only streams with high or moderate confidence are included in the income estimates. 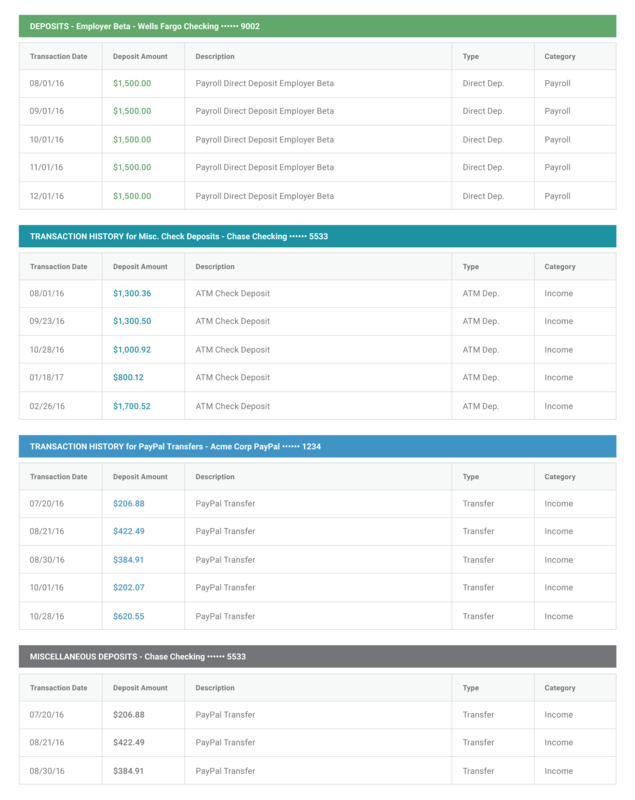 Each deposit stream contains a snapshot of the past 24 months of transactions along with the account owner name, account details, cadence, status, and amounts. For each deposit stream, all of the deposits that make up that stream are shown along with amount, description, type and category. Other miscellaneous deposits which did not qualify to be part of a deposit stream are also included along with amount, description, type, and category.